The Pearl Report documents the unique features of natural and cultured pearls, as either individual stones or strands. Characteristics such as color/overtone, environment, luster, matching, measurements, nacre thickness, origin, shape, surface, treatments, weight, and x-ray fluorescence are all considered as part of the evaluation and identification process. 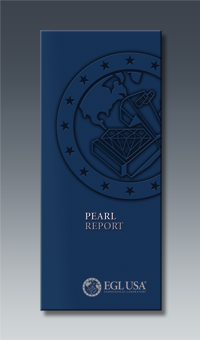 Pearl Reports are offered in a variety of styles, and are also available for pearl jewelry.